Selling is a numbers game. A maxim is a generally accepted truth. Calling is selling a “numbers game” is a maxim for two reasons. 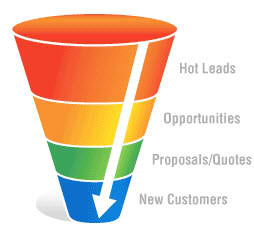 Enter the sales pipeline, and it’ll all tie together. A sales pipeline is a planning concept that helps managers and salespeople forecast sales for any given period – week, month, quarter or year. Think of your sales pipeline as overhead plumbing with faucets positioned at the calendar intervals your business requires. From these faucets you draw the mother’s milk of any business – sales revenue. Pipeline faucets come with screens that only allow a sale to pass through so into the pipeline you load only those prospects you have qualified. That means the prospects that have answered enough questions to allow you to determine that what they want, and your ability to deliver, will combine to produce a faucet-conforming sale within the timeframe or your forecast. Once in the pipeline, a prospect is either on track to become a sale or a forecasting mistake to be removed. At this point, let’s refer to The Bard. In Act I, Scene III, of Hamlet, Polonius famously says, “This above all, to thine own self be true.” If you aren’t honest about a prospect’s progress to faucet-conformity, you’re setting yourself up for forecasting failure.